Humanity's quest to send astronauts to Mars may get a boost from a student design competition being held this week. The Caltech Space Challenge, which runs from Monday through Friday (March 25-29) at the university's campus in Pasadena, asks two teams of students from around the world to design a manned mission to Phobos or Deimos, Mars' two tiny moons. "This is a technical feat that, by necessity, will spark innovation the world over," Nick Parziale, a PhD student in aeronautics at Caltech and leader of one of the teams, said in a statement. "We hope the Caltech Space Challenge serves as a reminder that these incredibly difficult problems are tractable, and that these passionate and dedicated students are just the women and men for the job." 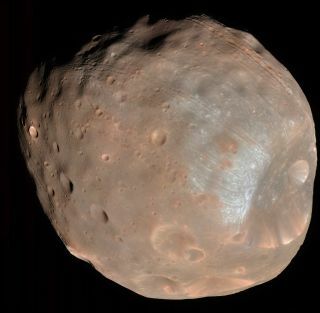 Many scientists view Phobos and Deimos as potential stepping stones to Mars itself, as well as locations from which astronauts could efficiently operate robots exploring the Red Planet's surface. The two moons are both tiny, with Phobos measuring 14 miles (22 kilometers) across and Deimos just 8 miles (13 km). They're probably former asteroids that Mars' gravity captured long ago, researchers say. NASA is looking into sending astronauts to Phobos or Deimos as part of a broad investigation of manned Mars mission options. In 2010, President Barack Obama directed the space agency to get humans to the vicinity of the Red Planet by the mid-2030s. Students participating in the design competition hope their work brings a manned journey to Mars a little closer to reality. "Sending humans to the neighborhood of Mars, and back, is going to be one of the most challenging engineering feats ever attempted," Jason Rabinovitch, another Caltech aeronautics PhD student and leader of the competition's other team, said in a statement. "The Caltech Space Challenge is our way to continue to support and advance what is bound to be a long process of design, development and innovation leading to human footprints on Martian soil," Rabinovitch added. Public lectures associated with the design challenge will be given Monday through Wednesday (March 25-27). The public is also invited to attend the competition's final presentations on Friday afternoon. More details on the student contest are available at the Caltech Space Challenge website.